Australian-based globetrotter Barbara Flett travelled with Uzbek Journeys to Kyrgyzstan and Uzbekistan in spring 2017. With fellow travellers, she discovered the life-changing scrumptiousness of Kyrgyz homemade jams. There is a previous Uzbek Journeys post on 5 Reasons for Visiting Kyrgyzstan – the mountain scenery, craftsmanship, history, culinary influences and a sense of time travel to past eras – but this catalogue of reasons, while valid, misses another important enticement. Kyrgyzstan, I venture to nominate, could potentially claim a World Heritage listing for its jam. The culinary skill of Kyrgyz households in jam making stands unrivalled, but there are reasons why this is not widely appreciated outside the country. While visiting in May 2017, our tour group first discovered this particular skill at Mairam Omurzakova's house in Kochkor. After a demonstration of her renowned skills in felt carpet making, her hospitality extended to lunch which included, among other delights, a superlative homemade raspberry jam. When some in our group suggested that she might include a sideline in making jam to sell to her visitors, Mairam looked surprised. She explained that her garden only had enough raspberry bushes to make jam for her family and the odd tour group who came to lunch. It was the same in the other home stays or hotels on the trip. Fantastic jam – all of it of the homemade variety and mainly sourced from the contents of the garden. Mairam Omurzakova (centre), not only a master felter, but also a master jam maker. 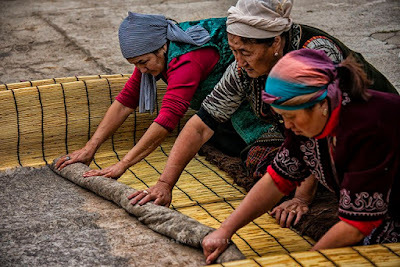 In a country of largely subsistence farming, Kyrgyz families will usually have their own plot for growing vegetables, their fruit trees and berry canes and their livestock. The jam produced by the women of the family is for household consumption and not for commercial sale. According to Wikipedia, while agriculture makes up a substantial proportion of Kyrgyzstan’s GDP, only 7 % of the country is suitable for farming. But from that 7%, Kyrgyz cooks are able to conjure the most delicious, dark and intensely flavoured jams our group had ever tasted. And once having sampled the jammy offering at Mairam’s house, we went on a jam sampling spree at every meal. As well as raspberry jams, we discovered a delicious black cherry jam, several varieties of plum and apricot plus of course strawberry jams. 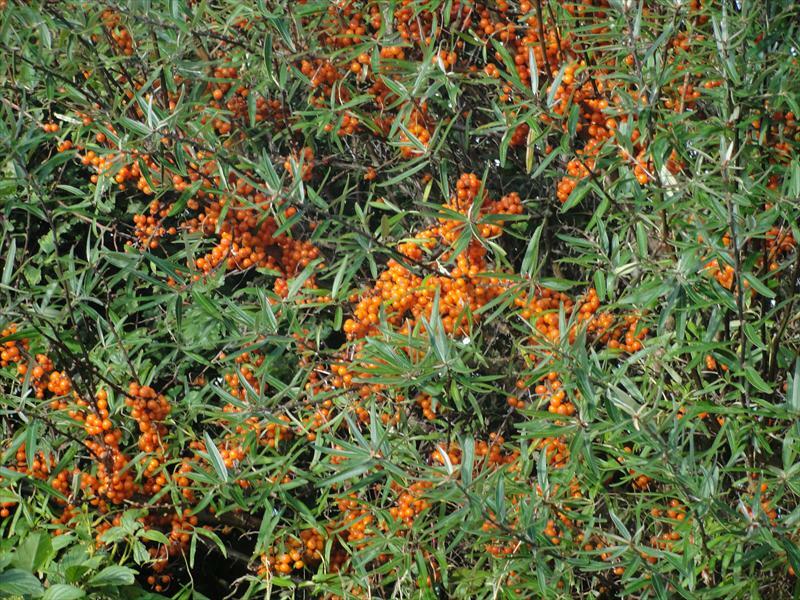 Most interesting of all was jam made from the berries of the sea buckthorn bush which grows wild in the Kyrgyz mountains. 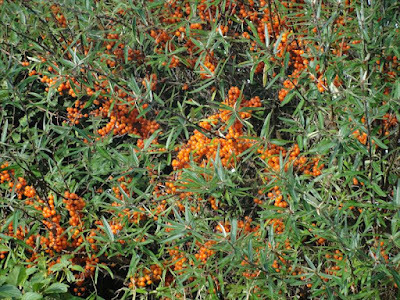 These yellow or orange berries produce a jam the colour of clear marmalade but with a tart citrusy flavor. Sea buckthorn is high in anti-oxidants so this jam was not only delicious but also good for you. 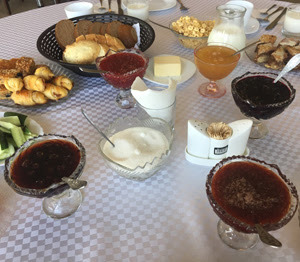 In researching Kyrgyz jams, we discovered that jam could be eaten at every meal. For breakfast with porridge or yoghurt or as an accompaniment to blinis or pancakes. Kyrgyz lunchtime spreads would always include delicious bread for sharing and a jam or two which would already be laid out on the table. So one could, and we frequently did, get stuck into the bread and jam combination between even the savoury courses. Then there are Kyrgyz desserts such as borsook – a sort of fried doughnut - which is also traditionally served with jam. And finally there is the Kyrgyz practice of sweetening their tea with jam instead of sugar. Particularly delicious is a spoonful or two of black cherry jam in tea which produces something which closely resembles a hot Ribena drink. 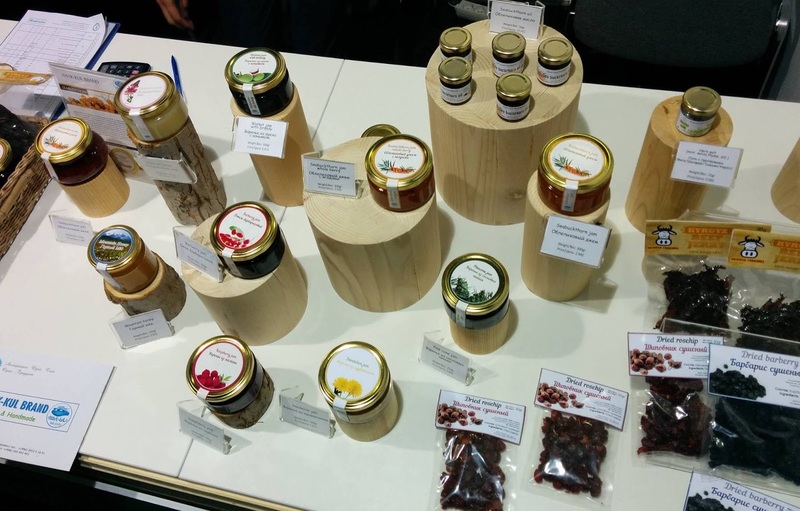 So if travelling to Kyrgyzstan, please sample all the homemade jams on offer. After all you won’t be able to buy some to take home - the locals aren’t sharing this particular bounty with the rest of the world. Range of delicious jams available at One Village One Product, Karakol. This Japanese NGO works with women of the Naryn region. And their delicious jams are for sale. Flavours include: sea buckthorn, chamomile, pine cone, dandelion, walnut, barberry.